Season 7 episode 3 The Queen's Justice aired just a couple days ago. Since then, the relationship between ruling women and their female attendants, relatives, and counselors has been taking up way too much of my time. When Jon Snow arrives at Dragonstone, he is met by the Dragon Queen's Hand, Tyrion, and "her most trusted advisor" Missandei. While Missandei has been a constant presence since season 3 there have been no scenes of Missandei giving counsel to her queen or of the queen soliciting advice from Missendai, apart from linguistic and cultural translation. Greeting Jon Snow at Dragonstone. Missandei, "the queen's most trusted adviser" is placed behind Tyrion in order of precedence and on the same plane as a Dothraki warrior. Her clothes strongly reference her queen's latest sartorial statements crossed with her warrior lover Grey Worm's. She has a status brooch for House Targaryen, a circle of three dragons, while Tyrion wears the brooch of a Hand, the senior advisor to a ruler. She holds the position of a Chamberlain but not necessarily the ruler's most trusted advisor. Instead, especially in this most recent episode, she is functioning more as the court Chamberlain. She greets people, sits in on meetings - albeit quietly, conveys messages from the queen, announces titles, maintains the sanctity of the court by taking weapons into custody, directs Dothraki warriors to manage these tasks, and escorts visitors to the castle smiling at them when they cringe crouching at the first site of a dragon. She knows the secrets and public stances of the court and holds a position of power, albeit not one of offering counsel. If Missandei is giving advice as the 'most trusted advisor', it is must be off screen and divorced from the current Daenerys plot currently driven by Tyrion's strategic policy with some frustration mixed with curiosity about Jon Snow. Missandei sits silently as Tyrion negotiates with the slave masters. Her participation in policy is only after the meeting is over when she opposes Tyrion's policy, but also helps sell it to the common folk. This is just wrong! Daenerys Stormborn, Mother of Dragons, Breaker of Chains braids her lady's hair and discusses 'man parts' as though stuck in a 1950s slumber party. The most memorable scene of Dany and Missandei on their own, season 4 episode 8 The Mountain and the Viper, is also the most jarring in terms of power relationships. Despite sitting at the top of Meereen's temple, conquering right and left, and breaking all those chains, the girls (women is not the right term here) are talking about 'man parts' ("stones and pillars") and braiding each other's hair as though they were at a 1956 slumber party. The queen is waiting on her servant. Irri, lady-in-waiting to Daenerys, braids the khaleesi's hair while teaching her Dothraki and assessing her fertility. There is no scenario where the queen would be braiding her servant's hair - and all who work for the queen are the queen's servant - even if Missandei is a recently freed slave, translator extraordinaire, aide-de-camp, and trusted advisor. Missandei should be braiding the queen's hair not the inverse. There have been no depictions of female domestic or body servants to Daenerys since the death of the Dothraki ladies-in-waiting in season 2 episode 2 Valor Morghulis. The Dothraki women at least seemed to be maintaining the queen's clothing and explaining their culture backed up by the unassailable statement "it is known". Ladies-in-waiting wield enormous power. The long stretches of time it takes to dress a queen and her hair along with the intimacy of these tasks naturally spill over into intimate talk of court happenings. Don't be fooled. The personal is political and no where so much as in a ruler's private chambers. Discussions, even casually dropped bon mots, within the ruler's private chambers is political and can shift policy. Chamberlains control access to the ruler physically, including what messages get delivered, and so also control the information on which a ruler makes decisions. The gendering of 'chamberlain' as male is traditional, but not descriptive. A finer point of etymology that both Dany and Missandei would appreciate. Shae, for her own safety is placed as a lady-in-waiting to Sansa, but becomes maternal towards her charge and protects her when possible inverting her lover Tyrion's intentions. Think the storming of King's Landing during the Battle of the Blackwater and her counsel to Stansa to lock herself in her room, or when she tried to help conceal that Sansa had started menstruating. This last failed because a lady-in-waiting to Queen Cersei came in and immediately related this personal detail to the queen who then could use it for political purpose. Dothraki lady-in-waiting Irri shows her khalessi how she has repaired her shoes and clothing. The GoT fandom on social media has gone nuts over Cersei's lady-in-waiting's imitative hair style, even though it should be expected that a servant would emulate their ruler. Missandei's wardrobe has kept pace with Daenerys's without much comment. 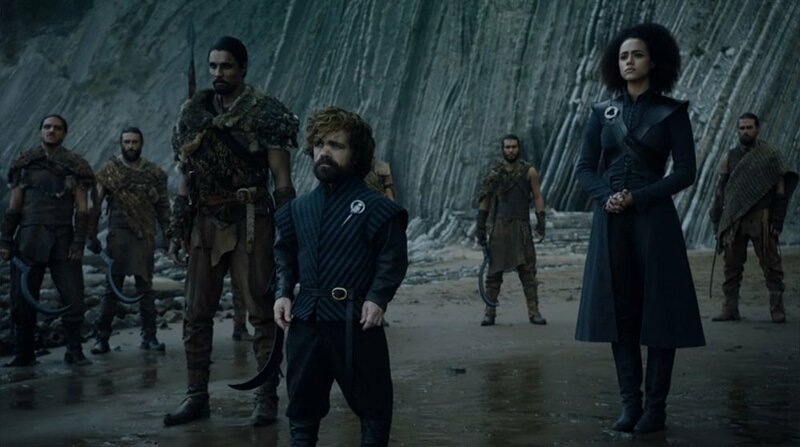 Gone are the pastel silks replaced by wools, felts, and leathers to stand up to the weather on Dragonstone and message a militaristic stance. As each episode airs, I wonder who is making the queen's endlessly morphing clothes - and her 'trusted adviser's'. There seem to be no other women at all resident at the Dragonstone court. And while I muse about Ellaria Sand having the Sand Snakes for emotional support who handily double as bodyguard-assassins, Yara's willing dependence on her castrated brother Theon as she takes female lovers in front of him, and the glorious Diana Rigg as Lady Olenna and her clear headed, if cynical, vision of a world bereft of family but not gold, I secretly fume at Sansa for not insisting that pre-pubescent Lady Mormont be HER trusted advisor. I can think of no one better. Ten-year old Lady Mormont, ruler of Bear Island, takes the northern lords to task for their cowardice while simultaneously nominating Jon Snow as King in the North.